This 1991 Upper Deck card shows Tony Gwynn signing autographs at the SkyDome in Toronto before the 1991 MLB all-star game. • When I was leafing through some old baseball cards, I stumbled upon a 1991 Upper Deck Tony Gwynn card (above). This card pictures Gwynn signing autographs at the SkyDome in Toronto prior to the 1991 all-star game. I can’t think of a better way for Canadians to remember this baseball legend who passed away after a lengthy battle with cancer on June 16 at the age of 54. By all accounts, Gwynn was as great a person, as he was a ballplayer, and that’s saying something. Gwynn won eight batting titles, was a 15-time all-star and was elected to the National Baseball Hall of Fame in his first year of eligibility. • On top of Gwynn, more than 80 former big leaguers passed away in 2014, including Canadians Jean-Pierre Roy and Oscar Taveras. Baseball Reference has the complete list here. • I missed this in my last column, but Scott Crawford, director of operations at the Canadian Baseball Hall of Fame, shared with me that Scarborough, Ont., native George Kottaras signed a minor league deal with the Chicago White Sox on December 18. The Canadian catcher will compete for a back-up job with the White Sox. Since making his big league debut with the Boston Red Sox in 2008, the now-31-year-old Kottaras has clubbed 32 homers in 313 career games. He has also suited up for the Milwaukee Brewers, Oakland A’s, Kansas City Royals, Cleveland Indians, St. Louis Cardinals and Toronto Blue Jays. • Twenty-three years ago today, Kapuskasing, Ont., native Kirk McCaskill signed a three-year, $7-million deal with the Chicago White Sox. At the time, this was the richest deal ever signed by a Canadian. McCaskill, who had registered 10 or more wins in five of his seven previous seasons with the California Angels, started for the White Sox in 1992 and won 12 games and posted a 4.18 ERA, before becoming a reliever for the next four seasons. He retired following the 1996 campaign with 106 career wins and was inducted into the Canadian Baseball Hall of Fame in 2003. • Of the 34 players on the 2015 National Baseball Hall of Fame ballot, two with Montreal Expos links will almost assuredly be elected. Left-hander Randy Johnson, who was selected by the Expos in the second round of the 1985 MLB amateur draft, and Pedro Martinez, who pitched four seasons in Montreal and won a Cy Young Award with the club in 1997, are virtual locks for induction. Other former Expos who should merit serious consideration are Tim Raines, Larry Walker and Lee Smith. Cliff Floyd is also on the ballot for the first time. Longtime Blue Jay Carlos Delgado also debuts on the ballot, alongside holdover ex-Jays Roger Clemens, Jeff Kent and Fred McGriff. The class of 2015 will be announced by the Hall of Fame on January 6 at 2 p.m. ET. • And a Happy 68th Birthday to Bill Lee! It’s safe to say that the Canadian baseball scene in the ’80s would’ve been a lot less interesting without the Spaceman. But between sprinkling marijuana on his pancakes, his wacky theories about the universe and his feuds with Expos management, it’s easy to forget that Lee was a very good pitcher. He had three consecutive 17-win seasons with the Red Sox from 1973 to 1975 and a 16-win season with the Expos in 1979. • This week’s trivia question: Eight baseball legends have been inducted into both the Canadian Baseball Hall of Fame in St. Marys, Ont., and the National Baseball Hall of Fame in Cooperstown. Name the three that were honoured by the Canadian baseball shrine after they received their plaque in Cooperstown. Please submit your answers in the “Comments” section below. The first person to provide the correct answer will win a 1987 Donruss Greg Maddux rookie card, a 1988 Fleer Tom Glavine rookie card and a 1990 Score Frank Thomas rookie card. Are the three Jackie Robinson, Tommy Lasorda and Dave Van Horne? Hi Brent. Thanks for the comment, I wasn’t thinking of Ford C. Frick Award winners (which would include Dave Van Horne), but technically you are correct. There is one other non-writer/broadcaster who is in both. Brent, you will win the cards. But can you think of the other double inductee who was in Cooperstown before St. Marys? Also the card of Gwyn, do you happen to know if Upper Deck did that logo for all the All-stars that year? Hi Brent. Yes, Sparky Anderson is correct. Thanks again. 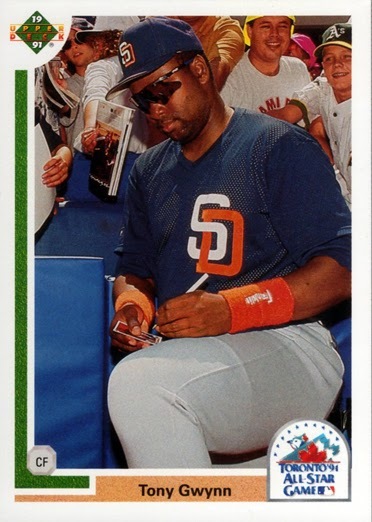 As for the Gwynn card, it is from the 1991 Upper Deck Final Edition series. It looks like all of the all-stars in that series have the Toronto logo. Thanks. I will mail the cards out to you tomorrow. Thanks for the additional insight Kevin, and once again thanks for doing the trivia! No doubt about Johnson and Maritnez in the Hall. Wonder if Pedro will wear the Expos hat?? Thanks for the comment, Devon. The Hall makes the call on the cap on the plaque now. I’m guessing Red Sox. i remember when 3yrs and $7 seemed like a ton of money. Stanton is making $1M a week during the baseball season now. wow!! I wonder who the people are in the photo with Gwynn. That would be cool if it was you. Thanks for the comment, Scott. It would be interesting to find out who the people are in the background of the Gwynn card. I see one has an A’s hat on.